HANK PHILLIPPI RYAN: I was going to dub today as Bookstore Appreciation Day, but then I realized every day around here is Bookstore Appreciation Day. Which sadly, acronyms to BAD, which is exactly the opposite of what it should be. Anyway. 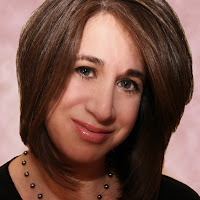 Jenny Milchman is exactly the right person to help us celebrate. And in honor of this BAD day--maybe it should have a new name, anyone?--we'll offer a copy of her much-anticipated COVER OF SNOW to a lucky commenter who tells us a favorite bookstore. Why is she the perfect person? Well, Jenny and I met at Malice last year, and became instant besties. She told me about how she and her family...well, it was really how when she was little, she,...well, it was more how how bookstores...well, let Jenny tell it. Jenny Milchman: I was lucky enough to grow up in a town that had four bookstores. And it wasn’t a big town. head into shops. I don’t think anyone minded. And I have this very distinct memory of being in one of the four and picking up Stephen King’s Cujo. You know the one with the slobbering face of the dog on the cover? On the back it described “a sleeping evil crueler than death”. Ohhh, did I want to find out what that sleeping evil was! Something crueler than death? WHAT could it be? But I didn’t have any money, so I had to walk all the way home and ask my parents. And they didn’t have any money either, not a lot anyway, not for things like new books when there was the library. gave me some folded bills, I ran (I must have run) all the way back to that bookstore and bought the book. And the flap copy writer was right—it was more evil—though it would take me a decade, and two or more subsequent readings, to really understand why. Long before then I was hooked, not just on Stephen King, but on the treasure palaces where his books were found. HANK: Even before your new book came out, you did a riduculo--I mean, amazing bookstore tour. Tell us more! And what did you learn that the rest of us can stea--I mean, discuss? It was in mine. But still. We spend a lot of time and resources on books. No college accounts for the kids yet. ’Nuff said. And we’ve discovered bookstores in the pokiest corners of the country—and they’ve been filled with readers and browsers and customers! There’s a lively bookstore scene, a level at which bookstores are real hubs of their communities, which reports of publishing industry changes sometimes don’t reveal. event or appearance one day. And a dozen other things become possible…when you open the door to a bookstore and walk in. bookstore is this--and where and why? walked into the store, there was a young girl behind the counter. It was like that old SNL skit with the late, great Gilda Radner as a child psychologist. This was a child bookseller. I began talking to this girl, and she was telling me about the science career she hoped to have, and it took a while for me to figure out that her mother was both the mystery and children’s book buyer for the store. HANK: So happy BAD! Any ideas for alternate names appreciated. And tell us your favorite bookstore! COVER OF SNOW--which comes out any minute now--to a lucky commenter! Bookstores are enchanted places, unique unto themselves, and absolutely need to be treasured . . . .
A tiny hole-in-the-wall bookshop specializing in second-hand books once yielded a copy of Isaac Asimov’s long out-of-print masterpiece “The Best New Thing.” Oh, how I despise that books go out of print . . . . Sadly, our local Atlantic Books has closed; now the closest bookshop is a good hour’s drive . . . . I think my favorite bookshop was a small store in California that sold lots of unique toys and always had authors stopping by for book signings . . . we had a wonderful conversation there with Ray Bradbury . . . . Once when I was at a conference in Washington, D.C., I went bookshop exploring and found a little shop crammed with books and magazines both old and new . . . I got a copy of a Life magazine from back when they were regularly doing stories about the astronauts which led to a wonderful conversation with Alan Shepard . . . .
Not really entering the contest, I just have a suggestion to replace BAD. How about a day to celebrate how Bookstores Rock our World -- BROW. Brow is better than Mad Susan! I am so crazy about bookstores. Luckily my two home towns--Madison CT and Key West, have them. RJ Julia in Madison is so worth a trip--it's beautiful and full of all the latest and brimming with knowledgeable staff and author events. The Key West Island Bookstore survived the withering attack on bookstores over the last couple of years. It's right off Duval Street, has old and new books, and really strong sections on local writers, Key West, and Hemingway. Love this little shop! Thanks for the post, Hank and Jenny! Ann Arbor has a number of great new and used bookstores but Aunt Agatha's is the best for the mystery lover. New and used books, book signings, their fall Book Fest, Aunt Agatha's doesn't just want to sell you books they want to sell you on books. 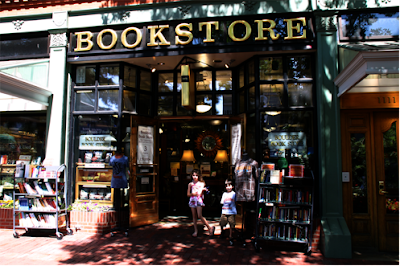 One of my daughters lives in Boulder, and works about three blocks from the Boulder Bookshop pictured. When I visit her I'm either flying and can't take on any additional stuff, or with my husband, who won't shop if his life depends on it. 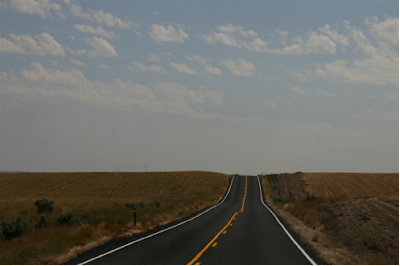 Next time I drive out there, though, that is on my list of things to do! We are so lucky in Cincinnati. There are two wonderful children's bookstores: the Blue Manatee in Oakley, and the Blue Marble in Ft. Thomas, Kentucky, right across the river. The Blue Marble has a room dedicated to, and decorated as the room in Goodnight Moon, which is awesome. http://pinterest.com/pin/21110691973552188/ The Blue Manatee is also fabulous, with a wall of signatures from visiting authors over many years, and a lovely little cafe adjoining it. And of course the Joseph Beth here has a fabulous children's department, which has nearly as many books as the other side of the store. I don't think I ever visited a bookstore as a child -- books came from the library or as gifts. But, I have been so lucky to know and love a few gems -- two are gone: The Cheshire Cat in Washington, DC was a treasure. Children's books, wonderful salespeople, and author events. In Falmouth, MA there was the Market Bookstore, several rooms of books piled and shelved. I lived quite near the well-known Politics and Prose in DC, which absorbed the Cheshire Cat into its children's department -- there is no book store like it. 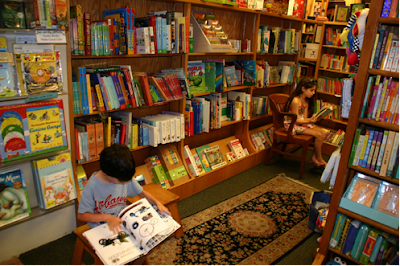 In Falmouth, the children's bookstore, Eight Cousins, has had to develop an adult section -- it is now the only book store in town. Eight Cousins is a magical place. We "heart" bookstores. That would work: We "hearticon" bookstores. My favorite bookstore of all time is, alas, no more. It was in Modesto, CA. What made it so special was the staff and owners. I'd hear part of a book review on NPR (unfortunately, no the part with the title or the author's name) and describe what I'd heard to someone in the store, and they always knew what I was looking to buy. On more than one ocaision, I would take a book to the register and have one of the owners tell me that they didn't think I would enjoy that particular book. They knew the taste of all their regulars. Boy do I miss them. I don't need to entered for the book as I have preordered it and will be waiting by my mailbox on Tuesday. So happy to see you here, Jenny, and congratulations on the new book. Bookstores ARE precious, and what a great way to appreciate them! Many things about the rich cultural life of Asheville, NC, amazed me after moving from the DC area. Among them is Malaprop's, an outstanding local book store of thoughtfully chosen books and an entire section devoted to the many talented authors who call the southern Appalachians home. Sadly, my favorite bookstore closed. But luckily I have a B&N not to far away so that's where I hang out now. And there's a really good Chinese restaurant in the shopping center. Good books, good food. Not a bad way to spend an evening. Hey all..running in late..I'm in NYC for MWA! BROW? Susan? Um, okay then... short for BROWSE, right? ANd you know, I was thinking the same thing, Denise Ann..I don't remember bookstores as a kid...hmm..
Jenny! Hey You!!! I love this post. 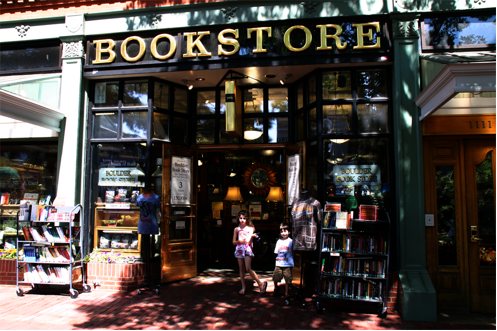 What a great picture of the bookstore in Boulder - with a great story to go along with it. Y'all, Jenny Milchman is one of the best cheerleaders on God's green earth. She cheers everyone on so selflessly and so sincerely. It's an honor to be able to now cheer her and her book. I was lucky enough to read it before publication, and it is every bit at terrific as I thought it would be. Better! I think we're going to be hearing a lot about COVER OF SNOW in the near future and for a long time. Three of my all-time favorite bookstores are Malaprop's and Captain's Bookshelf in Asheville, NC and another is E. Shaver in Savannah, GA (and any other we just happen upon while traveling and poking about). We didn't have a bookstore in town when I was a kid, or if we did I was unaware of it. But we had the wonderful Lane Public Library, which is still there. However, the toy store that was close to our home had a wonderful book department. Whenever I was given birthday money that was where I chose to spend it, on great novels like My Friend Flicka, or Nancy Drew, or the nurse books. They all had those colorful covers that cracked with use. Remember those? We've lost a bunch of bookstores in Cincinnati in the last few years. Such a shame. Jenny, I can't imagine a more fun way to spend time with your kids! I loved road trips when I was a child--drove over a good part of the country with my parents. Bookstores would have made it heaven. Weirdly, I don't remember going to bookstores as a child, only the library. I got books as gifts... and obviously my parents didn't order them from Amazon... Any memories from North Dallasites like me? Jenny, I think your kids are super lucky. That sounds like grand fun, and way better than standing in line at Disney in the hot sun, just to twirl around. What a good idea, a bookstore roadtrip! Even for adults, it would be great. Have you ever considered blogging or writing about the experience? Sorry about all the posts. Trying to do something else, and keep forgetting points I meant to make. As a kid the major source of my books were the school & public library. However, once a month my mother would take me to the local bookstore and I was allowed to buy 4 books (5 if I was really lucky and the money was there). As I got older I became something of an expert at ferreting out bookstores wherever I went. Then, in about 2007 I took a part time job at a new Borders built near me. We all know how that ended. But, with much support from my partner, I took a leap of faith and about a year ago opened a small bookstore, stocking a mix of new & used books. About 4 months ago I relocated to a larger space and the store is holding its own. I try to involve the community as much as possible, stocking local authors, having them do signings, etc. We have an event planned for March where by using a coupon 10% of your purchase will be donated to the local library. So, shameless plug....if you are in the northeast PA area stop into The Quiet Man Bookshop in Mountainhome (the Pocono area). What an awesome idea for touring the country! I think your children are definitely better off having been to 250 bookstores than Disney, because the love of books you're instilling in them will enrich their lives far more than the fun of a theme park, however amazing. We've never planned a tour around bookstores, but I do keep an eye out for them wherever we go (also for yarn shops; my daughter and I both love to knit as well as read. Sometimes simultaneously.) We never pass a bookshop without going in to see what they might have. One of my favorites was the original Wonder Books in Frederick, MD, a truly amazing used book store. They've expanded now into three locations and sell online as well; I don't know what they're like now, but 20-odd years ago, the store was like a treasure cave for readers. Congratulations, Jenny! A bookstore driving tour would be heaven for most of us. And congratulations, Charlie M, on your new bookstore! Long may it prosper! Love this thread. I'm so lucky. I live in Berkeley within easy walking distance of three bookstores and easy driving distance of several more--all celebrate authors every chance they get. I'm one of those who never saw a bookstore as a kid in small-town Texas, but the library! I knew it intimately, and I got books for Christmas. I have three favorite bookstores. i used to have many more, but favorites from years past have disappeared. My oldies are gone. Out of business. Closed. We need to buy from real stores when we can. Sometimes I call distant stores and have them send me a book signed by a local author. I started this practice several years ago when Louise Penny was a new author. I had learned about her from friends and family in Québec but could not find her book anywhere. She was that new. I called her local bookstore, Brome Lake Books/Livres Lac Brome. The owners, Lucy and Danny were wonderful and more helpful than I could have hoped for. Now that I am in Arizona, my other favorite bookstores are the Poisoned Pen in Scottsdale and Clues Unlimited in Tucson. You cannot top the personal attention these stores give you. They have all sorts of events and activities, including signings and book clubs and so much more. They want your business and will repay you many times over with excellent service fed with their knowledge and genuine interest. Books Of Wonder in New York City! Fabulous store with knowledgeable staff that can help you because they are readers! It was used as the basis for the movie The Little Shop Around the Corner. Peter Glassman is The Best! We were taken to bookstores as kids, and to the library, and to stores that had big book departments. It was always like being let loose in a candy store! I saved my money so that I could buy books, and I received books as gifts from my parents. My parents ordered books for us through Scholastic and other mail-order book companies. We also ordered books for summer reading; I don't remember if that was also through Scholastic. A walk down the street once a week to the bookmobile was a regular part of my routine before I was old enough to go downtown by myself to the main library. One of my fondest memories of my dad is the fact that he spent many of his lunch hours browsing bookstores for books for me to read when I was in second grade and constantly sick. It seemed like I nearly always had tonsillitis that year. By March - right after my birthday - I parted with my tonsils and adenoids, followed about six weeks later by pneumonia. When I wasn't getting caught up on school work, I was reading for pleasure. Dad started bringing books home for me early in the school year when I was too sick to go outside to play. Some were biographies, some were fiction. All of them kept me very happy! Most of my favorite independent bookstores are gone now. I live about half an hour or so from RJ Julia. As Lucy/Roberta said, it's a great place! I need to try to get there more often! When I'm on vacation, I always look for bookstores! In fact, my vacation budget includes money to buy books! It was really exciting, Jenny, to read about your family's vacation/bookstore road trips! Anonymous is me, Deb Romano. (using a borrowed computer today! I don't have a favorite bookstore but my favorite "book-place" while growing up in the 40s and 50s was our Carnegie library. What a wondrous place that was for a little girl who loved to read. I can't believe I left Vromans off my list! Whenever I visited my mother she would take me to Vroman's in Pasadena. It's old and wonderful. I have many books she bought for me there, including The Velveteen Rabbit by Margery Williams. With those gorgeous illustrations! Thank you, Hank, for hostessing me, and thank you, everyone, for comments I can't wait to read. Mahala, what a great distinction. That is worth quoting! BTW, Aunt Agatha's is another stop we have planned :) Can't wait to be sold on books all over again! Karen & Thelma, good tips. Thelma--I didn't know that one (and I'm a NYer) and also...I really, deeply appreciate the cheering. Karen, so neat that you recognized Boulder Bookstore! Kaye, it's you who has something worth cheering right now, too!! I wrote about the journey you've embarked on--and the wonderful poem Hank, I guess, led you to? That was quite a find for me this morning. Just what I needed. Anyway, thank you for being there from long before I ever trusted I would have a book out one day. I didn't know how close you were to Malaprops--if you were there, what a aprty we would have!! Karen, your adult bookstore road trip has a champion already--Larry Portzline in PA. He has done bus trip bookstore tours and is trying to make the business work. And please don't apologize for comments--I'm thrilled by the conversation the Reds always stir, and just hope I'm not commenting back too much!! Lark, and Leslie, and Terry, thanks for your comments! I love the term 'treasure cave' and Berkeley is a place I hope to get to soon. Leslie lives in a bookstore-rich (if sparsely spaced) state! Reine, what a testimony to booksellers your method is. AZ is another state I am hoping to see for the first time. Libby, you're the second person who has named Books of Wonder recently! Lil, your support of my writing heartened me at a time when that was hard to do. Thank you. Anonymous, wish I could respond by name, because I have similar bookstore memories from when I was sick...I think we would bond :) RJ Julia is a place I can't wait to visit soon!! Karen B., that library sounds majestic!! So many great bookstores and great bookstore stories! One of my all time favorites is Square Books in Oxford, Mississippi on the Square. Love the three stories & great books all over the place. When Arthur Miller died they had a lovely memorial window display set up in his memory. Turning Pages & More in Natchez, Mississippi is totally delightful and welcoming, a wonderful Victorian house filled with books and warmth. Had to extend my congrats! Every bookstore is my favorite. We miss our Saturday nights with Borders. Jenny love the idea of a bookstore driving trip. This may have to find its way into our life. We do always visit bookstores wherever we go. Brenda, I can't wait to be at Square Books on February 28th!! Turning Pages & More sounds wonderful, too! Hope you return this evening, Jenny, as I would love to know what time you will be at RJ Julia on Jan 22. It's been over a year since I was last there - I took a visiting relative there (that's the kind of hostess I am:-) and it's about time for me to get back there. It would be great to meet you! LOVED "Cover of Snow"! Great work, Jenny, and it was fabulous to meet you! We at Seattle Mystery Bookshop can't wait to start selling it, I must say. I will do my best to get to RJ Julia! Just checked my calendar and have a question mark for that date (some sort of tentative appointment) but am keeping my fingers crossed! Deb, I'm crossing my fingers we can meet, but no worries if you have something, of course! Jenny, I love the idea of the bookstore tour with kids! Much better than Disneyland. And I'm so excited about COVER OF SNOW finally launching. Hurray! I'm really looking forward to reading it. I don't remember bookstores when I was a kid, either. It was always the library for me. We were poor. But the library was such a gift. My favorite local bookstore is our newest, Mysteryscape. Two smart young women own it and are so supportive of authors and community. It's the meeting place for our local chapter of Sisters in Crime, Border Crimes. Of course, in the Kansas City area we are lucky enough to still have several great indies, though we've lost some along the way. Reading Reptile is a fantastic children's bookstore. Rainy Day Books is one of the great independent bookstores in the country. The Raven in nearby Lawrence is super. Prospero's is a small local chain of used bookstores that's active in the local literary community. And we still have six or so Barnes & Nobles and a BookAMillion. So we're quite lucky, compared to lots of other locales. My favorite bookstore is Quailridge Books and Music in Raleigh, NC. We are lucky in the RTP area of NC to have several REALLY fine bookstores, but this one is my favorite. My favorite bookstore for the past couple of years is Inklings in Yakima, Washington, where I now live. It's located in a beautiful little square, very clean and inviting. I haven't really talked to them yet because I really am shy with strangers, but I'm hoping to this spring. Jenny, you really ought to come here, you'd love the place and they do pay attention to traveling authors. No need to enter me in the contest, by the way. I've had your book on pre order for months and I just got notice that they'll be mailing it off to me in a day or so. Cannot wait to get it! And keep on doing what you're doing, Jenny. You're STILL doing everything right!!! For those of you lucky enough to live or travel to Minneapolis, be sure to check out these wonderful book stores, Uncle Edgar's and Uncle Hugo's ( www.uncleedgar.com & unclehugo.com) These 2 stores are housed together, are not fussy or fancy but they're heaven for any mystery or fantasy book lover. It's one of our hidden city gems. h ryan at whdh dot com and send me your address! Linda, it's terrific to see you here! I've been to all of those bookstores you mention...love 'em...except for Mysteryscape, which I'm so glad to hear about!! Stop numero uno when we get to return to KC. I hope that maybe you and Warren and even maybe Nancy--I wonder if we could all somehow get together?? Feel better, btw--hope it passes quickly! Prentiss, I will be coming to Quailridge, too! Cannot wait to see it! Beth, yes, Yakima is definitely part of the plan for this summer. Would love to get to meet you in person. Thanks so much for wanting to read the book. Means a LOT. Love the Minneapolis tips, thank you!! Lark, I am going to be at my publisher, signing books for the giveaway, on launch day. Tuesday. EEEPS. Thank you, thank you, all for wanting to win a copy. And thank you, Hank, for kicking things off with the Best Virtual Party Ever. Bookstores, conversation, and friends, new and old. Oh, how exciting! I can't wait to read it -- and review it on my blog, too! Hank, I've emailed you as requested. Thank you all so much!